Why teach Latin to your children? I am sure there are lots of really good reasons to teach children Latin. There is plenty of research out there about the benefits of learning Latin as a child. Personally, I chose Latin for my kids because I feel like it unlocks doors (and windows too!). Latin is the language of Science and Medicine, and knowing roots helped me like crazy in nursing school. Latin is a huge part of the English language (as well as many others). I don’t know if my kids will ever be fluent, or be able to read the classics in their original language, but I do think they will be well served for years to come because of their ability to “see” the Latin in the words they come across. Song School Latin, from Classical Academic Press is a program that allows you to start Latin, in a fun and kid-friendly way, to kids as young as the first grade. Latin vocabulary is taught through kid friendly songs. This is not an immersion program, instead of the songs being fully in Latin, the Latin words are incorporated into English lyrics, which makes it easier for kids to internalize the meaning of the Latin words by listening to the songs. What do you need to teach Song School Latin? When I first bought Book 1 for my kids a couple years ago, the only part of the program I purchased was the student book, which comes along with a CD of the learning songs. At the time, I was able to teach the vocabulary with just these portions of the program. 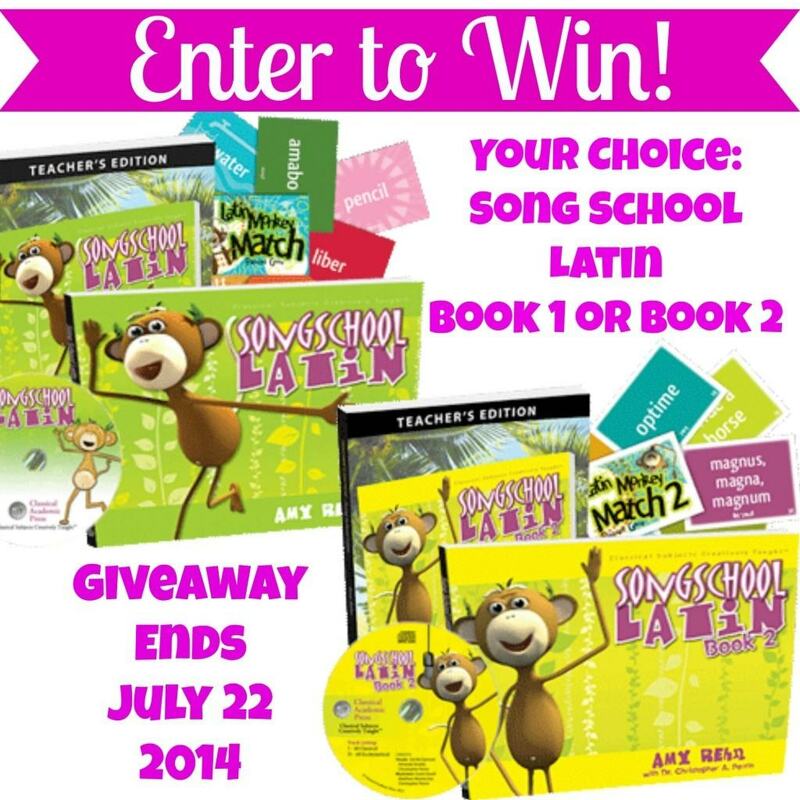 For this review, I was treated to the complete Song School Latin: Book 2 program, and was sent all the elements, Teachers Edition, Student Workbook with CD, DVD Set, and Latin Monkey Match 2 Flashcard Game. Now that I have seen the full program, and how well the elements work together, I can’t believe I didn’t get all the components for the kids for Book 1…. teaching and learning would have been much easier and much more fun! Book 2 is designed to follow Song School Latin 1, and serves as a bridge between Song School Latin, and the more advanced Latin for Children series, which is intended to be used with children in the 3rd grade and above. While you could start an older child in Latin for Children with no previous Latin experience, using the Song School Latin program, from a young age is an even better way to do it. Song School Latin is designed to be fun, and to be gentle. I would go as far to say that part of the purpose of this program is to help kids fall in love with the study of Latin. You want their first exposure to be something fun and enjoyable, and Song School Latin fills that purpose. Book 2 is a step up from Book 1. It’s more mature (but still quite silly and fun). 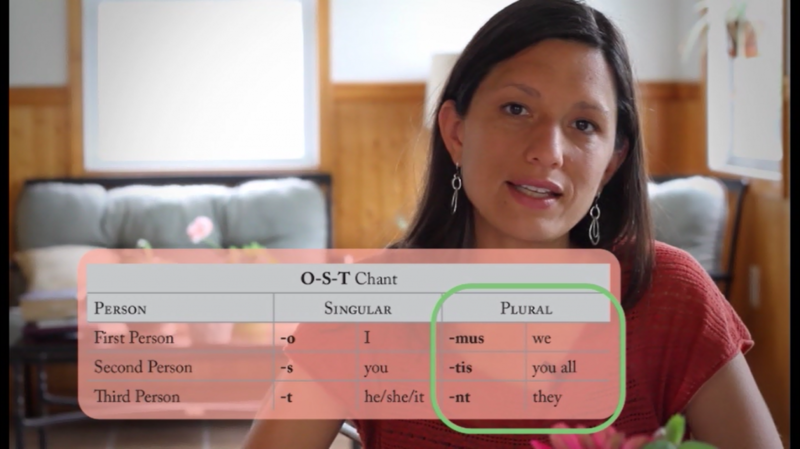 The biggest difference is that Song School Latin Book 2 begins teaching grammatical concepts, and some of the chants used to remember verb tense endings (like those used in Latin for Children) so kids can begin putting together the vocabulary they have learned in a more cohesive way. The Student Book and CD are the core elements of this program. The CD has two sets of tracks, one with ecclesiastic pronunciation, and the other with classical pronunciation of the Latin words. Which you chose is personal preference, and both are equally correct. The CD has one song per chapter, which helps children learn the vocabulary easily. Then, the workbook has multiple pages of instruction per chapter with worksheets to reenforce what has been taught. 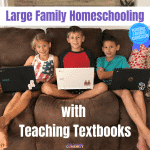 Even though the teaching material is right there in the workbook, because this program is tailored to younger children, a teacher is really required to work through the material to help the child understand it clearly. The Student Book is self-teaching, with instructions included right along with the text. Because of this, the Teachers Manual does not add much to the actual teaching portions of the lesson. What it DOES include are all the solutions to the worksheet pages, and a section of additional worksheet pages to supplement the workbook (one per chapter for most chapters, and then extra review pages for the book as a whole). For me, I really need the solutions because I am learning Latin right along with the kids, so this book is necessary to teach the program well. The DVD set for Song School Latin Book 2 covers a lot of ground. If you (the teacher) have very little Latin exposure (or none at all) I really recommend you make sure you have this part of the program to work with. For the lessons, you again have the choice between classical and ecclesiastic pronunciation of the vocabulary, and then the teacher teaches the lesson for you! Along with the grammar and vocabulary, one of my favorite parts of the DVD is the “Derivative River” which shows words derived from the Latin word, discusses the origin and meaning, and even covers some history. This part of the program takes the vocabulary to the next level, and helps kids apply their knowledge to English words and vocabulary. The DVD also has short animated skits that incorporate the vocabulary into cute stories. This is Bug’s favorite part of the Song School Latin program. We love using games to help us review material. 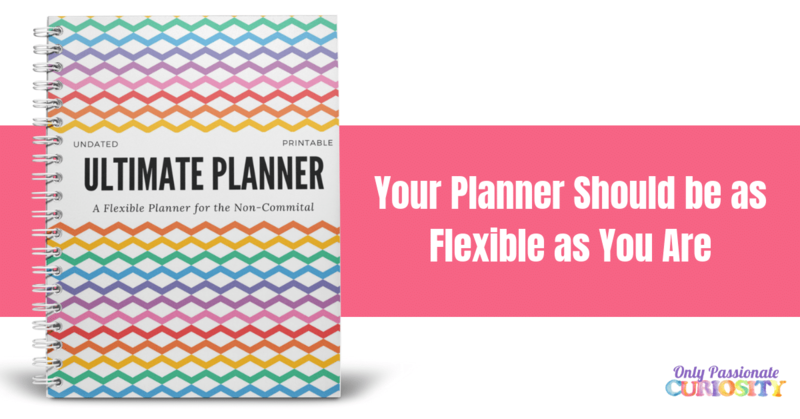 This flashcard set is HUGE- there are hundreds of cards, all printed in full color. 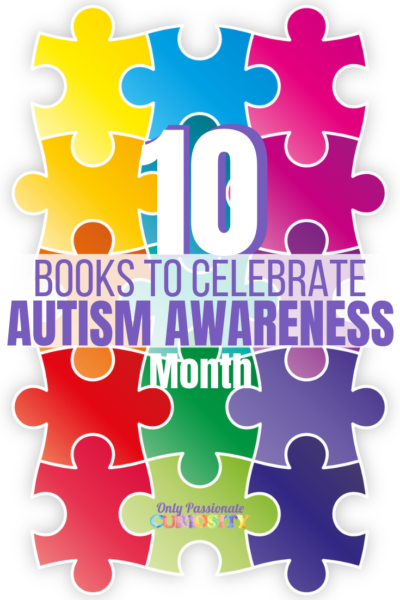 When I received mine, I split them up into zip-lock bags, one for each chapter (the cards are numbered at the bottom to make them easy to sort and use), so they would be ready for me to grab them and go as needed. 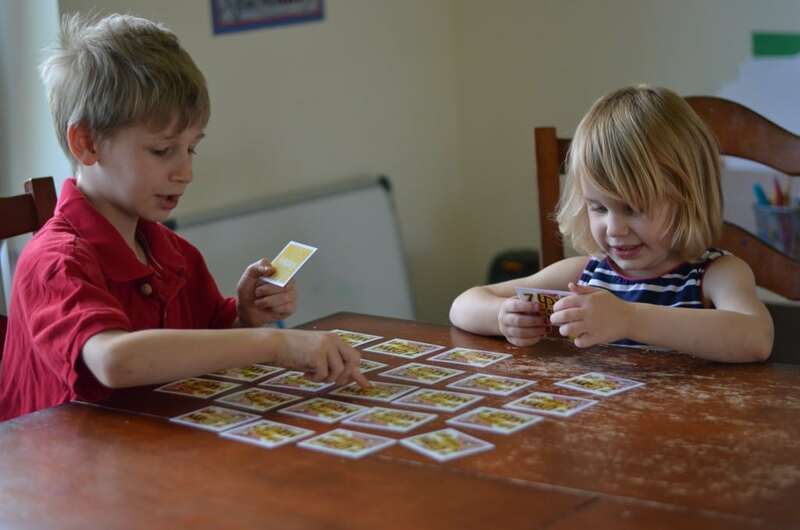 With these cards, you can play memory, go-fish, or use them as flashcards as you review. When I first received this product, I was pretty sure I was going to use it with Bug and Mr Man both together. 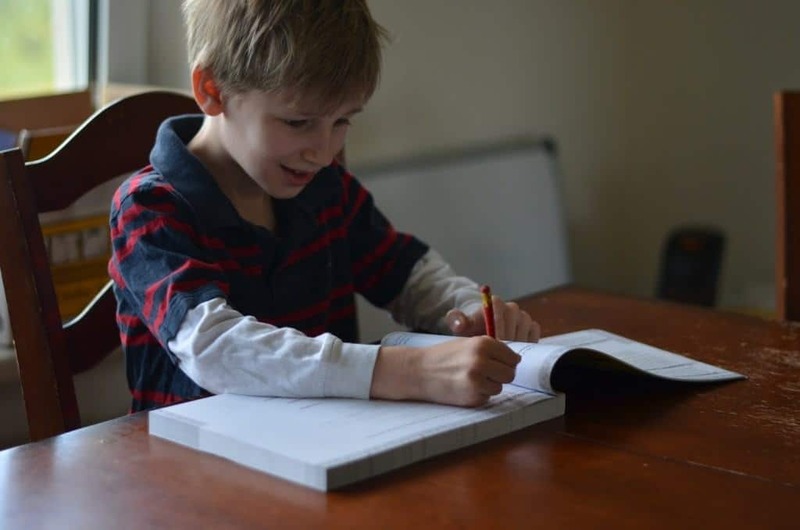 Both boys completed Song School Latin Book 1 a couple years ago (using only the student book at CD) and then Bug had moved on to complete a basic Latin vocabulary course from another company. I had thought this would be the right level for Mr. Man, but assumed Bug would be probably too advanced for it. Today, I eat my words. After seeing the full program, I decided what I really needed to do was have Mr. Man take another go with Song School Latin 1, and Bug was a perfect fit for this program. Song School Latin 2 is a big step up from 1 because it does begin to cover grammar more in depth. 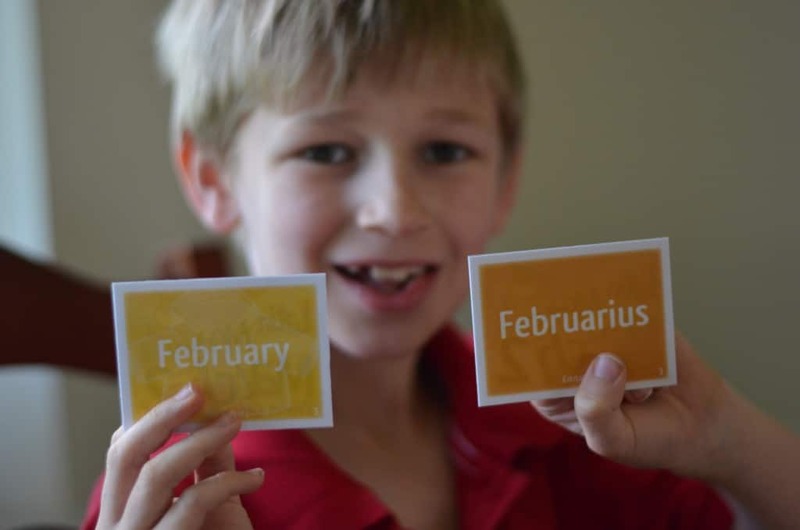 I feel like I would have had better retention with my younger son, had I had a DVD and card game set to use with him, and now that I have Song School Latin 2 in front of me, I do agree that it is best for older kids with some Latin exposure. This program is meant to be used three days a week, and we found that was perfect when using all the components. Each week does include quite a few worksheets, so it took us about 45 minutes a day to complete all the work. I also had the kids listen to the CD daily. We would listen to the weekly song as much as possible to get it memorized, and it made the rest of the work much easier to get done! I like that Song School Latin keeps things fun. In addition to the silly songs, and the cute skits on the videos, Bug also enjoyed playing the card game, coloring the free vocabulary pictures, and playing around on Headventureland (Classical Academic Press’ free website) to review his work. Classical Academic Press has offered one of my readers their choice between Song School Latin Book 1, or Song School Latin Book 2 (Shown here!). You can enter to win using the rafflecopter giveaway widget at the very end of this post! I am really loving the offerings from Classical Academic Press. They offer so much more than just Latin! A couple months ago, I shared our review of their new writing program, Writing and Rhetoric on the blog, and since then, they have released 2 more books in that series. The store also has Spanish (in the same format as song school Latin! ), Greek, logic, bible, and more… so check them out! 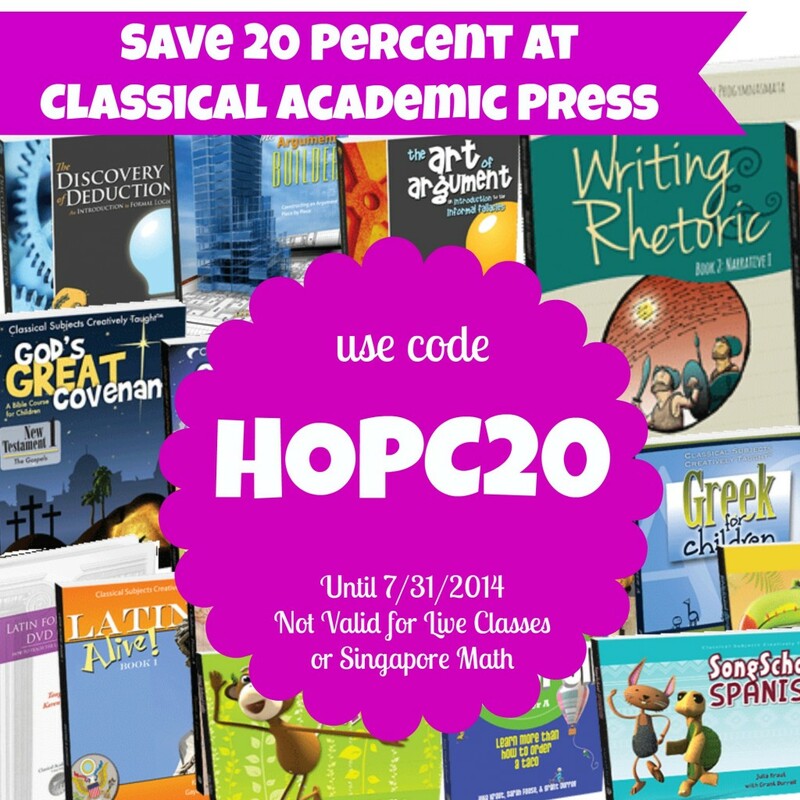 If you see anything you like, you can save 20 percent until the end of the month with the code HOPC20 (code not valid for live classes, or Singapore math). Are you interested in selling your song school latin set? Not at this time 🙂 The younger kids are going to use it next year! My wife is using song school latin 1 with our daughter. we tried Song School Latin 1 this past year and loved it. The dvd was a great way to reinforce each chapter-my kids enjoyed the derivative river bits. I don’t have any experience with Latin. Excited to learn with my kids though! None hat so ever. It will be a learning experience for the four of us. i had six years of latin, and can’t wait to introduce my kids! I have minimal Latin experience but I’m enjoying larning ir with my children! We started Song School Latin 1, and my daughter loved it! Can’t wait to try SSL 2 next year. Lots of experience with Latin through Latin for children and CC. My youngest will be starting latin this coming year with SSL. I think he’s going to love it! We are using Song School Latin 1 and would love to move on to SSL2. I don’t have much experience with Latin, but did transfer into a school where students had 2 years of Latin in middle school. They had a distinct advantage in understanding vocabulary and other concepts. Just starting Latin this year with older (12,14) kids. Need all the help I can get! Thank you for explaining the program so clearly. I have gone back and forth on whether or not this is something I am capable of doing with my girls and now I think it is. I took latin in college and we are doing SSL1. I’m just starting to homeschool my kids and am looking for an easy way to introduce us ALL to Latin. I learned several “bits” of Latin in school (roots, romance languages), but not enough! My son would love to learn the latin grammar. he is 13 latin 2 would be great. A little experience with Latin through The Phonics Road program . I have some experience with Latin through Classical Conversations! But, i would love the opportunity to teach my 8 year old with Sing Song Latin! Thanks for a chance to win! We did Classical this past year and enjoyed the Latin, but this would make it so much easier. Yes, I do..my older kiddos (middle school and high school) started Latin two years ago. First Form Latin and Second Form Latin (We love Mr. Moore). I was looking for curriculum for my youngest (7 year old)…This looks like the perfect fit! No I haven’t done latin yet. I have been looking at this for a couple of weeks thinking if I should use this. If I win I will. I took one year of Latin in high school, not that I remember anything! I would love for my boys to learn Latin. I have no experience…well okay. So I found this really old Latin book in my grandmothers stuff ages ago and proceeded to teach myself the first 2 chapters. But that was wiped from my mind ages ago. LOL! I took one year of Latin in high school but didn’t do the best. I still wanted my daughter have the wonderful foundation Latin provides. I was really excited to find Song School Latin 1 used for a very good price but when I started looking through it, I panicked a little. I did some research and came across the DVD. It was the best purchase I could have made. 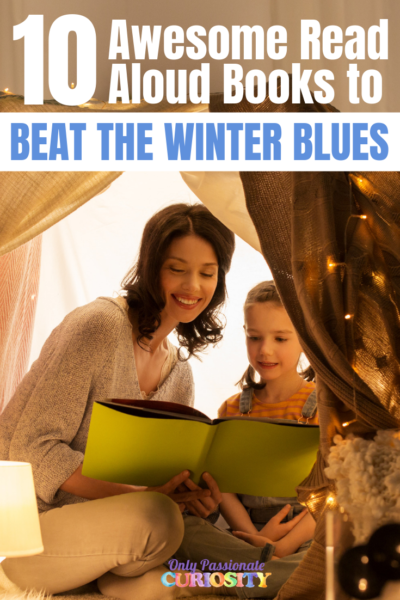 It has really helped both my daughter and I learn. I am really impressed with the difference the DVD made in our home too. I really need to pick up the first one for Mr. Man asap. I wish I had it the first time around with Book 1!